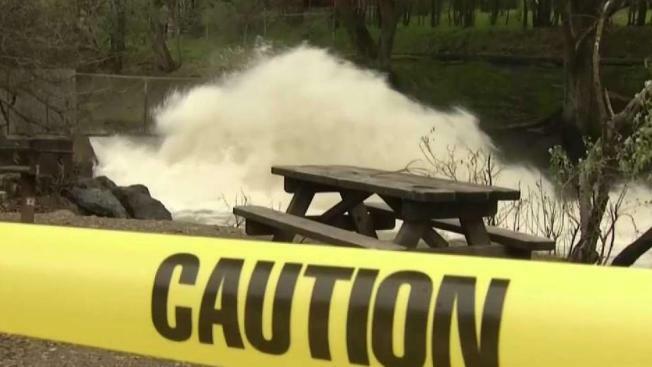 The Santa Clara Valley Water District is releasing thousands of gallons from the the Anderson Reservoir in order to prevent a flooding similar to the one that happened in San Jose two years ago. Damian Trujillo reports. Hundreds of thousands of gallons of water are flowing out of Anderson Reservoir in order to prevent flooding from the expected storm is which is set to bring large amounts of water. The Santa Clara Valley Water District announced this week, it will be releasing up to 179,000 gallons a minute. The dam must remain at 58 percent capacity in order to avoid flooding. During a drought, the dam usually stands at 24 percent capacity. "Been filling up these past storms, so we started releasing water a little early to provide room," Kurt Arends from the Santa Clara Valley Water District said. "It is so early in the season so we wanted to make sure there’s room going forward to capture future rain." Two years ago parts of San Jose flooded after water rushed out of the Anderson Spillway. Spokespeople from the water district said there is no reason to worry about a possible flooding this year. "Drove up there to see how full it was, not as full as I thought it would be," Bob Bacosa said. "Still, it looks like a lot of water coming out of here." Depending on the total amount of rain expected, the water district may close the valve completely.